Mark's first big TV break was when he appeared in the The Farm in 2000 and met director Kate Woods. She gave him a key role in her mini-series Changi in 2001 and since then he's been no stranger to television. 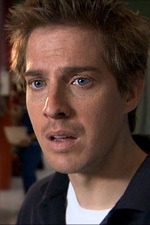 Mark's played a semi-regular role in The Secret Life of Us and appeared in Blue Heelers before his first on-air appearance in All Saints in July 2004. Mark also has some notable theatre credits. He worked with the famed Bell Shakespeare Company where he played 'Silvio' in The Servant of Two Masters as well as with The Sydney Theatre Company in Major Barbara, both in 2003. Born in Perth, Mark has always wanted to act and from a young age used to entertain his school friends with his classroom gags. Mark moved to Sydney in 1997 to study at NIDA and appeared in many student productions including before graduating in 1999. Mark loves to play golf, boules, tennis and goes to the theatre in his spare time. Mark passed away suddenly in 2008 at the age of 32. Dan has a sunny, positive disposition - a smile for everyone, and a good attitude to work. He loves the blood, gore and adrenaline rush he gets in the Emergency Department. Dan's keen to learn new things and puts them into action at every available opportunity. He doesn't hold back on his thoughts and opinions - often blurting out personal questions - but is sensitive to the needs of his patients and colleagues. He's charming and good-looking but not a cad. Dan is an easy-going young guy. He's insightful enough to know that he should be looking towards maturing and becoming more stable in his personal life, but he still enjoys partying, and being young too much to quite let it go. He enjoys watching cricket, going to the pub with his mates, seeing live bands and getting picked up by good-looking women. He decision to take up nursing was influenced by the side benefit that he'd be surrounding by plenty of young, single women. If his mates ever think he's less of a bloke for being a nurse, he's very quick to point this out and they soon see where he's coming from. Dan comes from an ordinary, lower-middle class family with two sisters and a brother who is now in a wheelchair. Dan is a loyal friend who will drive those around him crazy one minute and be the biggest support the next. Over and above it all, Dan is a great nurse.